When I started my gardening the most popular houseplants were rubber plants (Ficus robusta), Swiss Cheese plants (Monstera deliciosa) and African violets (saintpaulia). 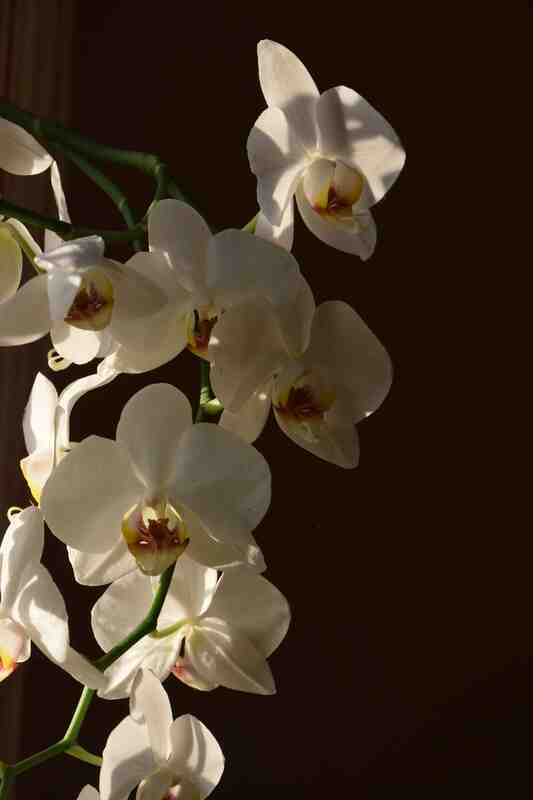 A lot has changed in those decades and the most popular flowering houseplant is now phalaenopsis. 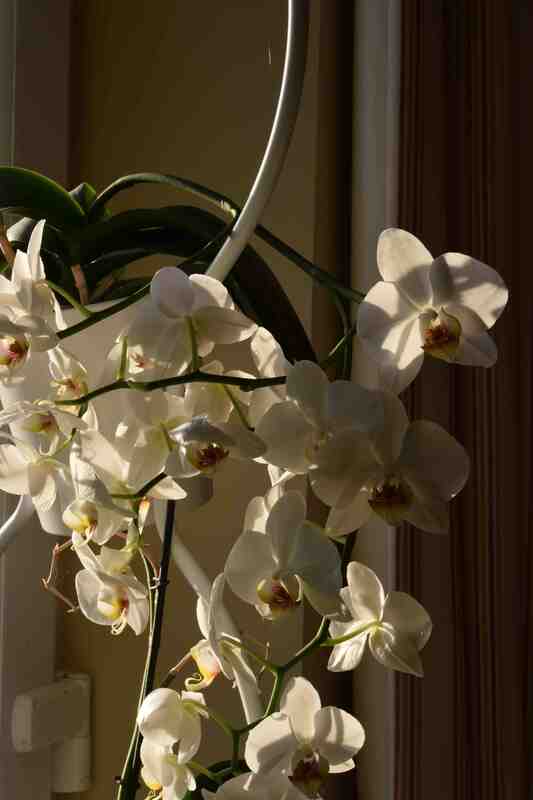 These easy and beautiful orchids are so readily available and so inexpensive that they are now commonplace rather than exotic. But in this case familiarity has not bred contempt, at least in this household, and I often buy new plants when I see one that attracts me. My mood changes and sometimes I am drawn to the dark or coloured flowers but the classic white is my favourite other days. The new ones tend to spend their first months on my bedroom windowsill. This faces east. 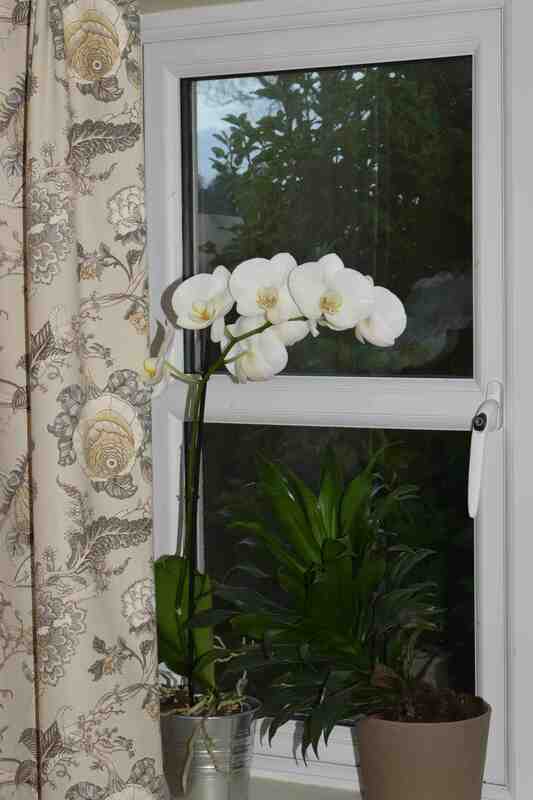 After flowering they go into a less obvious place, on windowsills facing north or east. By the way, the flowers should last months. I have had plants in bloom continuously for more than a year on their original spike by which time a new spike had been produced. They want good light but not a south-facing window. Too dark and the new leaves get long – too bright and the leaves turn yellow or scorch. They must have good drainage and NEVER sit in water. Water them as much as once a week but always tip excess water from the pot cover. If you go on holiday and don’t water them for 2 weeks they will be fine – leave them in a puddle of water and the flowers and leaves will drop off – a month later. They prefer a constant temperature that never gets lower than 18c. They will take lower temperatures than this but they should be kept drier. They are evergreen and do not have any storage bulb (or pseudobulb) so do not have a dormant period. If the leaves drop off and it looks dead – it is dead! If the small flower buds drop off when you get the plant home it was dried out or chilled before you bought it – more flowers will come. The old flower stem, when the blooms drop off, may (probably will) produce new flowers, either from the ends of the stems or from new sideshoots that appear lower down so do not cut them off until they start to wither. New flower shoots will appear if the plant is healthy, fed and in good enough light. Often these grow at odd angles, so I put older plants where the flowers can cascade over the pots – I think they look nicer than trying to stake the stems. Here they are in the kitchen (and yes, another IKEA product!). The window faces west and this would be too hot in summer but is ok from autumn to spring. The ‘ugly’ roots that thrust over the pots are trying to cling onto the bark they think they are growing on. Leave them alone. I feed the plants when I feed the other houseplants, about once a week from March to September and once a month the rest of the year. They get the same diet as the rest. I have never found the need to buy a special fertiliser but I do tend to use a high-potash fertiliser or something seaweed based. 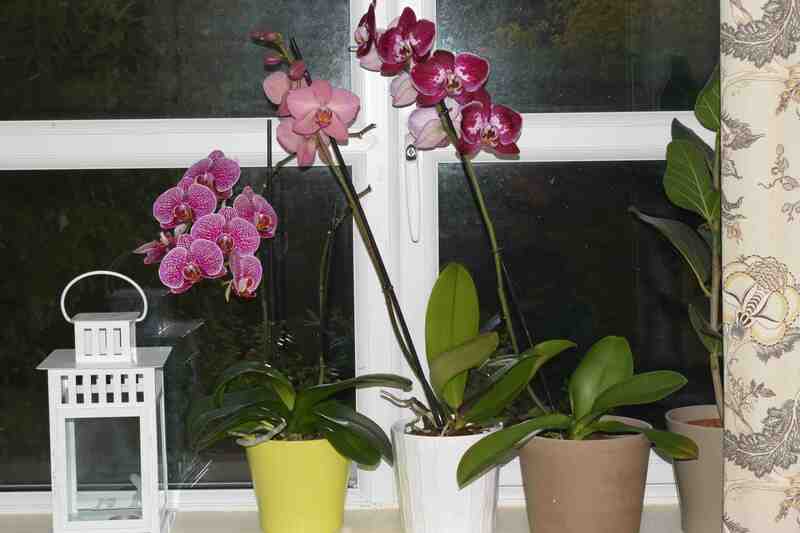 These orchids do not have huge roots and will not need repotting for about 2 years after you buy them. If you do need to, because they are growing out of the pot, repot into the smallest possible pot and use a bark-based orchid compost. 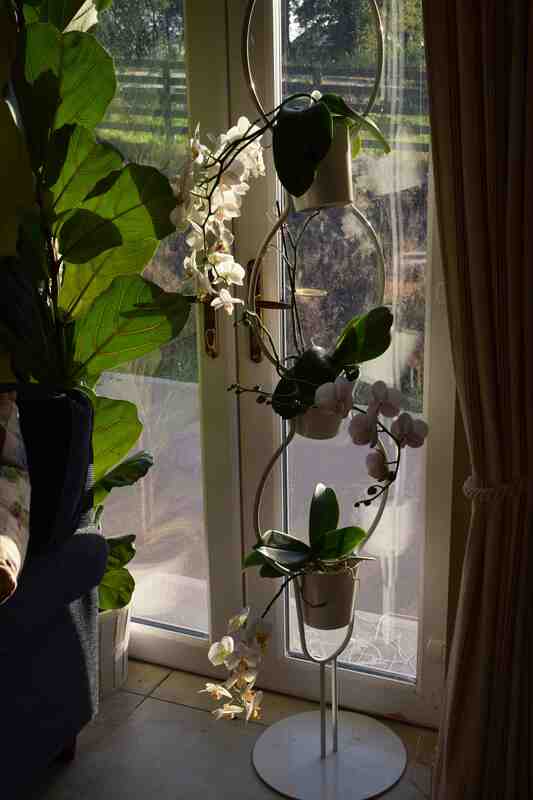 Ordinary compost will suffocate the roots and kill your orchid. If in doubt, don’t, when it comes to watering. 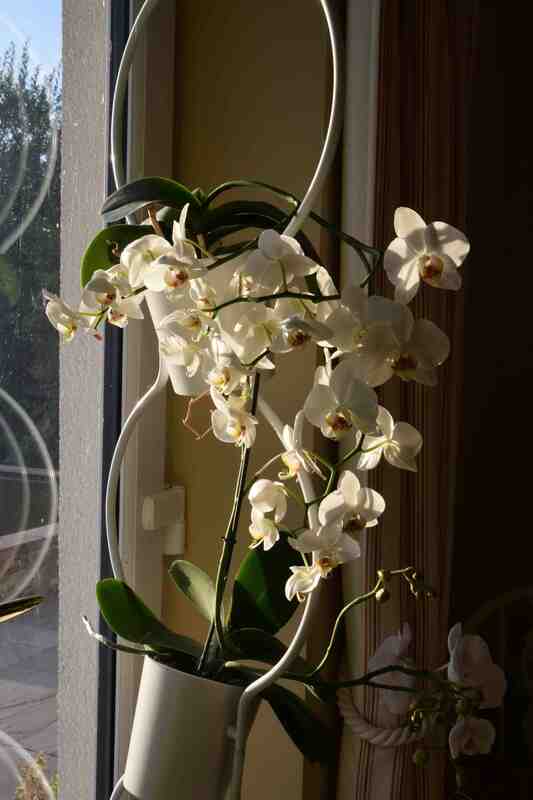 You will kill your phalaenopsis if you over water it. If it is a bit dry it won’t grow as well but at least it will live. * Yes I know that those of you with a knowledge of botanical nomenclature will be even more horrified!